WEST PALM BEACH, Fla. -- Some people compete to have the best lawn in their neighborhood. 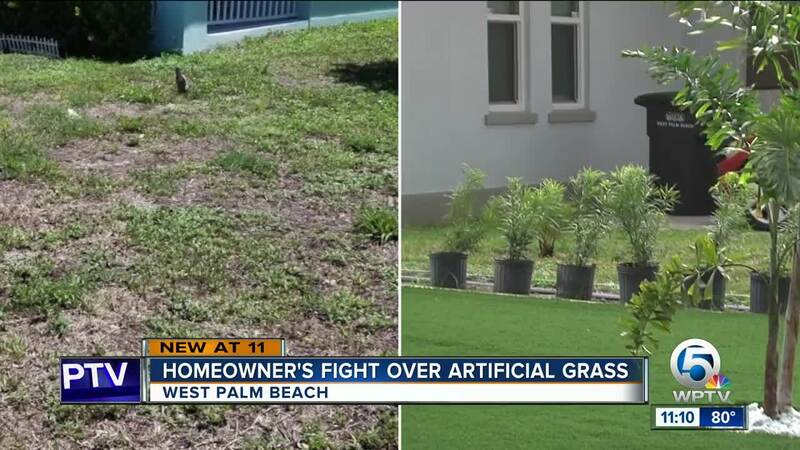 But a West Palm Beach man is fighting to keep the fake grass in front of his home, as the city threatened to fine him every day it’s out there. Kenny Evelyn tried to grow a real lawn, but the best the ground would let it look was brown and spotty. It was ugly. Frustrated, he decided to install an artificial lawn at his Coleman Park city project home. The first time homeowner wanted to come home from work to a good looking yard, so he saved for three and a half years to afford the $8,000 lawn project. “After seeing under the dirt, not only is there no dirt-because under the sod there’s no sand but also there’s garbage from the construction,” he said. The land was unfit for any wanted growth. West Palm Beach’s code enforcement said not so fast. It’s illegal to have artificial turf in your front yard, something Mayor Jeri Muoio pointed out to him at the August 27th commission meeting, when Kenny went to challenge it. “The rule is that you can’t have artificial grass in your front lawn. You can have it in your back. You can’t your front. You should have known that,” she said. Kenny argues this is the only way to get a quality yard. Plus, he says, when he went to get a permit to install a new driveway, he asked about landscaping. "'Are there any rules? Anything I have to worry about?' (The person helping him with the permit) said no. 'We really don’t worry about landscaping. The only thing you have to worry about is if you’re putting anything permanent,'" he recalled at the Aug. 27th meeting. He showed the commission the before and after, who noted its asthetic appeal. "It looks beautiful," the mayor said. And there’s a chance he can keep it. "We’ll see what we can do," the mayor would also say. "I hope this gets resolved because I can’t afford to take a loss," Kenny said during our interview. We reached out to the city Monday, which is observing the Rosh Hashanah holiday. They said they are continuing to work with Kenny.